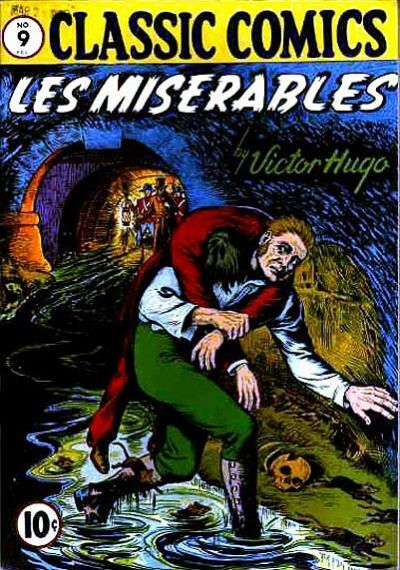 I recently discovered that the Classics Illustrated adaptation of Les Misérables is available digitally through ComiXology. For $3.99, of course I had to check it out. It’s a very faithful adaptation. 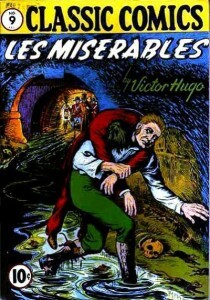 At 45 pages, it’s also very abbreviated, focusing even more tightly on Jean Valjean than the Jordan/Perkins film did. Still, it manages to get a surprising amount of detail into that space. For one thing, this was done in the era when comics would cram as much story into a panel as they could, using narration and speech/thought balloons to make a single panel do double or even triple duty. In many cases, they actually quoted lines from the novel. While it does a good job of cramming the plot into a single comic — or maybe because of it — the storytelling is very matter-of-fact. There are exciting scenes in the story that could have been played up better. [ETA: And they were in the earlier version.] The editing hurts the flow at times, as well. Nothing and no one is introduced until Valjean encounters them for the first time: Not Fantine, not Cosette, not the Thénardiers, not Marius, not the ABC Society. Sometimes that’s fine, but sometimes it’s confusing: After Marius loses track of Cosette, he decides there’s nothing left but to join his friends at the barricade — wait, what barricade? For that matter, what friends? The art is impressively detailed, and while at first I thought it a bit static, it’s grown on me. I did find myself laughing at some of the costume and hair choices, though. Not that I’m an expert on 1815-1832 French countryside and Paris fashion, but there are commonalities across the movies and stage versions I’ve seen, and I figure those costumers did their research. I’m not sure how much remastering has been done. The typewritten lettering is original, and turns out to be quite legible on a 7″ tablet even showing the full page. The coloring has clearly had some attention. It’s actually lined up properly, and a lot of backgrounds feature gradients that just weren’t possible in the 1960s. Fortunately, even if colors are a bit muted, they resisted the tendency among DC and Marvel to go fully realistic when recoloring art that was meant for a more expressionistic look. The book ends with a set of articles. From the original release, there’s a biographical sketch of Victor Hugo, an article on the brutal state of criminal justice in France prior to the Revolution (though it’s still pretty nasty afterward, as the novel shows), and for some reason a piece about inventor/industrialist Peter Cooper. Finally, there’s a newer article about the book’s themes and the background of the Classics Illustrated version. The history of this comic book is a bit convoluted. 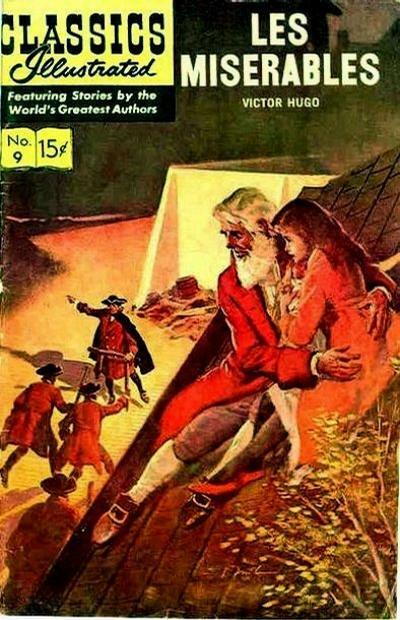 Ordinarily I’d just go to the Grand Comics Database, but it turns out that Classics Illustrated reprinted their comics many times over the years, keeping the same issue numbers. 1943’s Classic Comics #9 featured a 60-page adaptation by Evelyn Goodman (script) and Rolland H. Livingstone (art), which was reprinted several times as Classics Illustrated #9. But that’s not the version in the digital edition. That comes from the 1961 “reprint” which actually contains an entirely new 45-page adaptation, written by Alfred Sundel with art by Norman Nodel (credited as Norman Nobel on ComiXology). 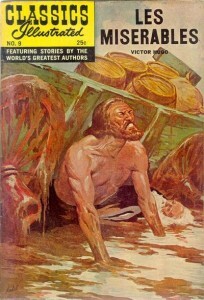 According the afterword, Livingstone’s art style had fallen out of favor by the late 1950s and the story had been withdrawn from their reprint schedule until they had it redone. Now I’m really curious about the 1943 version! Update: I’ve found a copy and reviewed it! 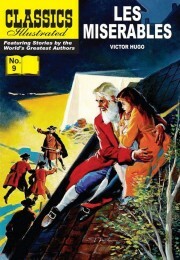 Classics Illustrated #9 is available digitally through ComiXology, as a Kindle edition, and probably several other places. This entry was posted in Reviews and tagged Adaptation, Comics on June 8, 2014 by Kelson Vibber.